In this lecture, The Soccer Ball and the Golf Tee: Anatomy of Shoulder Impingement and Beyond, Eric Beard covers the anatomy of the shoulder and explains what happens when things go wrong in this complicated structure. Shoulder Impingement – Training around Shoulder Impingement – Do I Need Surgery for Shoulder Impingement? In this lecture, The Soccer Ball and the Golf Tee: Anatomy of Shoulder Impingement and Beyond, Eric Beard covers the anatomy of the shoulder and explains what happens when things go wrong in this complicated structure. What causes shoulder pain — how to we avoid it, and recover from it when it happens? 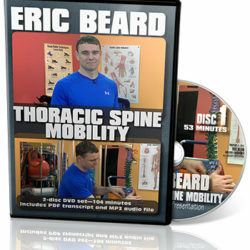 Eric Beard is a corrective exercise specialist who lectures widely about human movement and corrective exercise, works with individual clients and holds a position at NASM. You can keep up with Eric on Facebook.